Actually, I lie. My writer’s block remains. But… I do want to share a recent experience I had with my favorite niche chocolate variety. That would be, of course, dark milk chocolate. In this case dark GOAT MILK chocolate. Weirdly enough, the chocolate bar that inspired this post is actually made by one of my least favorite chocolate makers — Mast Brothers. Actually, all joking aside, it was high time I gave the bearded brothers’ bars another chance. It had been two years since I’d last tasted their chocolate. In fact, I don’t think I’d sampled a Mast bar since they were outed by that Dallas Food article accusing them of… how to put this delicately… minor fibbing about their chocolate production practices. In the last two years, not only has Mast rebranded (dropping the “Brothers” to become just Mast Chocolate), they also dramatically improved the texture of their chocolate. Gone is the grittiness and that caustic astringency so noticeable in their bars of yore. The new Mast bars are creamier, more balanced, and actually kind of… edible. Hurrah! But I didn’t sit down to write this post in order to trumpet improvements at Mast Chocolate — far from it. What actually got me excited is the wide availability of their goat milk chocolate bar — not always an easy flavor to find (thank you Whole Foods). And the new, improved Mast goat milk chocolate bar is almost everything I want in a goat milk chocolate — it’s sour, funky, pungent, creamy and interesting in a way regular milk chocolate rarely is. To be fair, I’m NOT suggesting you go out and buy this chocolate bar. In an old post reviewing Manoa’s goat milk chocolate, I linked to Estelle Tracy’s hilarious video of her reaction to trying goat milk chocolate. Needless to say, the flavor of goat milk chocolate is not for everybody! But if you like super funky tasting milk chocolate, I highly suggest giving the Mast bar another chance. A while back, I tried unsuccessfully to create chocolate mousse out of whipped chickpea canning liquid (aka aquafaba). I had such high hopes. But alas, after several failures in a row, I threw in the towel. At the time I was making a lot of hummus and chickpea blondies (yes, they’re a thing), and I didn’t want to throw away all that (potentially) useful chickpea canning liquid. So… I saved it. Lots of it. And I tried again. This time, it worked. Throw all ingredients except the optional cocoa powder in a bowl and whip with electric beaters on high for 6-12 minutes. Add the optional cocoa powder at the end, and be careful not to over beat it. Chill the liquid before you attempt to whip it. Use the highest setting on your electric egg beaters. If you own powerful electric beaters, you should have stiff peaks in 6-7 minutes (if your electric beaters aren’t so powerful, this may take you 10+ minutes, but it will work… eventually). Use real sugar. Liquid sugars like honey and agave might also work, although I haven’t tried them so I can’t say for sure. But don’t use stevia — it tastes awful in this recipe. Trust me on this one — this is chickpea liquid we’re talking about, it already has a weird aftertaste and stevia seems to accentuate it. Flavor with vanilla extract, even if you’re making chocolate mousse. Vanilla masks the chickpea flavor quite well. Don’t try to bake these. While I know numerous vegan bloggers (and the New York Times) have claimed that these can be baked into meringues, I’ve tried several times with no luck. I’m pretty much convinced it’s impossible. The “meringues” will melt into puddles after just a few minutes in the oven. Low heat, high heat — it doesn’t seem to matter, they deflate into sad little puddles. Then they burn. They smoke. They stink up your whole house. Your husband will shake his head in bemused resignation as he disables the smoke detector (again). Skip the meringues. Add the cocoa at the very end, after you’ve already whipped up a nice mousse. Also, since the cocoa powder will devolumize your mousse, you’ll need to eat this immediately. To prevent over-mixing/deflation (see pics below), make a cocoa paste by adding a little chickpea liquid to the cocoa powder and stirring until smooth. Then FOLD the paste into the mousse using a spatula or wooden spoon. Don’t use electric beaters to do the mixing — you’ll deflate your mousse. Use dutch processed cocoa powder, which is less acidic and dissolves more easily than the natural (undutched) type. Use only the bare minimum amount necessary to develop chocolate flavor (~1 tbsp for this recipe, give or take). Try this recipe with real dark chocolate rather than cocoa powder. Melt the chocolate gently in the microwave (you can follow these instructions) and gently fold it into the whipped chick pea liquid. Then chill the mousse for a couple of hours to give the cocoa butter in the melted chocolate time to harden. The resulting mousse will be much longer lasting (and tastier) than the cocoa powder version. Just my $0.02. My personal feelings about aquafaba mousse? If you’re a vegan and have a killer craving for chocolate mousse, this recipe is for you. Otherwise… my honest opinion is that egg whites are a better foundation for a mousse. Even when pasteurized, egg whites whip faster, plus they hold their shape better when baked. What does “70% chocolate” really mean? The answer may surprise you. You know that 70% dark chocolate bar you bought recently? Did some teeny part of you feel pretty good about buying really dark chocolate because, well, dark chocolate is good for us now? Would you be surprised to learn that there might be MORE good-for-you stuff in a 60% chocolate bar, or even a (gasp) milk chocolate bar, than in the 70% bar you picked up? Here’s the issue: the cocoa % on chocolate bar wrappers doesn’t actually tell us how much chocolate is in our chocolate (if by chocolate we mean ground-up cocoa beans — the brown stuff with all the antioxidants). In fact, cocoa % is totally useless for that purpose. All we can reasonably expect to learn from the cocoa % is how much SUGAR has been added to our chocolate — and even that is only true for dark chocolate. Confused yet? Let me try to explain. Total cocoa percentages include not just chocolate liquor, but also added cocoa butter. The amount of each ingredient need not be disclosed by the chocolate maker, and the ratio between the two ingredients can vary wildly. Dark couverture chocolate, which needs to be highly fluid if chocolatiers are to work with it, often has a nearly 1:1 ratio of cocoa liquor to cocoa butter. Eating and baking chocolates don’t need as much cocoa butter, so their ratio may be closer to 2:1. Here’s where the confusion around cocoa % becomes an issue for consumers. Say you’re choosing between two chocolate bars with the exact same ingredients, listed in the same order. You’re frustrated because the ingredient percentages aren’t listed on the packaging. But as an experiment, let’s pretend for a moment that they are. In both cases, the % chocolate liquor and the % cocoa butter add up to 70%. Both bars have the same amount of added sugar. However, the first bar contains 66% actual ground up cocoa beans, whereas the second bar contains only 41%. That’s a 25% difference. And as a consumer, you have no way of knowing which is which. That’s right — you could buy a dark milk chocolate bar and get MORE ground cocoa beans by weight than you would’ve if you’d bought the #2 dark chocolate bar above. So if you’ve been buying dark chocolate for health reasons, these numbers may give you pause. The only way to really know exactly how much chocolate liquor is in your chocolate bar (besides calling the chocolate maker and asking) is by buying chocolate with no added cocoa butter. It does exist — chocolate makers sometimes call it “two-ingredient chocolate,” since this type of chocolate typically also excludes lecithin and vanilla. I like Undone Chocolate‘s two-ingredient bars, although admittedly I’m biased because I’ve spent a lot of time helping out in their shop. But many other chocolate makers make two-ingredient chocolate — Taza, Dandelion, Rogue and Sirene all do, just to name a few. I recently tried a great one — an 82% two-ingredient bar made with Peruvian beans by Maverick Chocolate, from Cincinnati, Ohio. You can find other two-ingredient brands at most good chocolate stores, or check out the selection at Chocosphere. But here’s a longer term solution to the cocoa percentage problem: chocolate makers should provide consumers with the percentage of chocolate liquor or cocoa solids in their bars, not just the meaningless cocoa %. Giving consumers a breakout of exactly how much of a bar is made from whole cocoa beans and how much is added cocoa butter (which, btw, most chocolate makers buy in bulk from industrial manufacturers, although there are exceptions) would be a more honest, transparent way to market chocolate. It would also discourage chocolate makers from adding extra cocoa butter for the sole purpose of inflating their chocolate’s cocoa percentage. Another perk: providing information about the percentage of chocolate liquor in chocolate might even boost sales of dark milk chocolate, which is poised to be the next big thing in high end chocolate. But I’ll save that for another post. Are you confused by couverture chocolate? You aren’t alone. I hadn’t even heard of it before I began my confectionery training. But never fear — here’s the quick and dirty on couverture chocolate for your reading pleasure. Couverture is a type of chocolate made specifically for confectionery use. Its defining characteristic is its higher cocoa butter content (32-39% ADDED cocoa butter, on top of the cocoa butter already present in the cocoa mass). The extra cocoa butter makes couverture thinner when melted, so professionals can achieve super-thin, super-shiny bonbon shells for their confections. It also gives couverture a really smooth texture and mellow flavor — in no small part because the cocoa butter significantly dilutes the flavorful (but less creamy) cocoa bean mass. Chocolatiers refer to the more liquid quality and easy pourability of melted couverture in terms of its viscosity — specifically, they categorize couverture as “high viscosity” chocolate. When I first started working with chocolate this confused me to no end, because in physics, the higher the viscosity, the THICKER the liquid. For some reason (maybe they were high on theobromine), chocolatiers decided to reverse that — they call chocolate that is thin and runny “high viscosity.” Clearly someone wasn’t paying attention in high school physics class! You may be wondering if you’ve ever tasted couverture, or if you would even recognize it if you saw it on a shelf, and my guess is that you would. Valrhona and Callebaut are two of the most well known couverture makers — you’ve probably heard of them. Michael Cluizel, Amedei and many others make excellent couverture too. If you’re interested in a couverture starter kit, I recommend ordering it on Chocosphere, which has a great selection of bars and sampler packs (I love this one). Try the Valrhona classics like Manjari and Guanaja. Jivara is a great couverture milk chocolate (also by Valrhona), if that’s what you’re looking for. If you do try any of these, please let me know what you think of them. This two-ingredient mousse tastes like a fluffy, whipped, lightly sweetened, extremely intense chocolate bar. In a bowl. Need I say more? Traditionally, chocolate mousses are made using cream or egg whites, and their volume and thickness is achieved by whipping air bubbles into them. This chocolate mousse, however, achieves its fluffy texture via an altogether different mechanism: the chemistry of cocoa butter. Cocoa butter is solid at room temperature. But if you get the proportions just right, you can create a perfect mousse-like texture by adding just enough water to melted chocolate so it only partially solidifies as it cools, creating a mousse-like texture without the help of air bubbles. I would actually classify this as a whipped water ganache rather than a mousse, if I were going to get technical about it. If you think of regular chocolate ganache as, say, a cappuccino, then water ganache is black coffee: strong, dairy free, slightly bitter and super stimulating. Optional variations: I recommend adding a pinch of sea salt to the hot water before melting the chocolate. Alternatively, try flavoring the mixture with a few drops of peppermint oil or vanilla extract, or substituting coffee for the water to get a nice mocha flavor. Serving recommendations: This would taste great over fresh berries, with a dollop of whipped cream or crème fraîche on top. But it’s pretty great on its own, too. Mix the chocolate and water in a small bowl and microwave on high for 30 seconds. Stir. If the water feels hot to the touch and the chocolate is melting easily, you’re done with the microwave. If you still notice chunks of chocolate in the water, microwave the bowl for another 10-20 seconds. Whisk until the chocolate is completely dissolved and no graininess remains (this step is very important for a silky result). Place the bowl of liquid chocolate in a shallow ice bath. Using an electric whisk or egg beaters (an immersion blender would probably work too, although I haven’t tried it), whisk the chocolate as it cools. After a few minutes you should begin to see its texture thickening modestly. Stop mixing and remove from ice bath once the mousse has reached the thickness of softly beaten egg whites. Btw: If the chocolate mixture cools too much it will develop a texture like that of chocolate frosting (you can see an example of this in the picture below). If you accidentally over-thicken it, try whisking in another teaspoon of hot water. This is what happens if you leave the mousse in the ice bath for too long! I know, I know, enough with the gianduja already! I promise this is my last post about the chocolate-hazelnut deliciousness known as gianduja for, well… at least a week. My recent recipe for Gianduja Crunch Truffles included directions for making your own gianduja (a wholesome, less processed version of Nutella) at home. Shortly after publishing that post, I was contacted by a happy reader who had made gianduja for the first time. He was spreading it on toast and mixing it into everything imaginable (he warned against mixing it into coffee — seems like good advice!). Anyway, the reader loved homemade gianduja so much that I was inspired to make it easier for readers to locate my gianduja recipe without sifting through lengthy instructions on truffle-making and chocolate tempering. I love this gianduja recipe because it’s so simple and so wholesome. If you’ve ever looked at the ingredients on a jar of Nutella, you’re aware that there’s nothing healthy about that mixture of sugar and palm oil (ew). So it was important to me that this recipe include only the highest quality ingredients: roasted nuts and super dark chocolate. No fillers, and no added sugar (the only sugar in this recipe is what’s already in the dark chocolate). A quick note on substitutions: If you want to eliminate sugar from this recipe completely, try substituting 8 oz. unsweetened chocolate plus your sugar substitute of choice for the dark chocolate. After blending the other ingredients, add the sugar substitute to the food processor slowly, tasting until it’s sweet enough. As I’ve mentioned before, I personally like stevia as an alternative sweetener, and stevia works well to sweeten nut butters so it might actually be a good choice for this recipe (I’ve never tried it though, so don’t quote me on that). Other sugar substitutes (honey, xylitol) and noncaloric sweeteners (sucralose, aspartame) would likely work as well. You could also substitute cocoa powder and sugar (or a sugar substitute) for the dark chocolate in this recipe — if you try this, please let me know how it tastes! So here you go: a super simple recipe for making your own delicious, addictive, healthy chocolate-hazelnut spread using nothing more than your oven/toaster, a microwave and a food processor or Vitamix. To roast the nuts: On a baking tray on the center rack of your oven, toast the hazelnuts at 350 degrees Fahrenheit for 15-20 minutes, stirring occasionally until they’re fragrant and golden brown (but not burnt). Wrap them in a clean dish towel to cool on the counter. Once cool, use the towel to rub off the skins, removing any stubborn skins with your fingers (leaving the skins on won’t ruin the gianduja, but they do taste a little bitter). To melt the chocolate: Melt 8 oz dark chocolate in the microwave. To do this without burning the chocolate, place the chopped chocolate pieces in a plastic container (glass or ceramic will retain too much heat) and microwave for 2 minutes, stirring every 45 to 60 seconds. Continue microwaving at 10 second intervals, stirring well after each interval. To avoid burning it, stop when the chocolate is 80% melted — its residual heat will melt the remaining solid chocolate pieces as you continue to stir. The whole process should take less than 5 minutes. To make the gianduja: In a food processor or Vitamix, blend the hazelnuts into a paste, scraping down the sides as needed. The consistency should be like that of creamy peanut butter. Add the melted chocolate and blend until creamy. Store the gianduja in a tightly sealed container away from sunlight for 1-2 months, or in the refrigerator for 6-12 months. Note: if you store gianduja in the fridge, you’ll need to microwave it (or leave it at room temperature for a couple of hours) to bring back its soft, spreadable consistency. 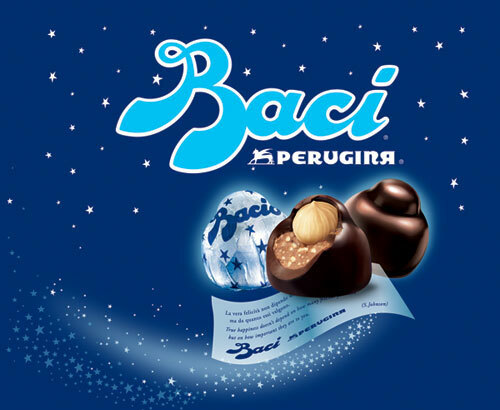 This truffle was inspired by Perugina’s Baci, those addictive Italian chocolate-hazelnut confections that have started showing up in American supermarkets everywhere. I wanted to add some texture to the classic round truffle by pressing a whole hazelnut into its center. The result is delightful; the hazelnut provides a wonderful textural contrast to the otherwise uniform creaminess of the gianduja. And since we were talking about sugar-free chocolate last week, here’s another cool thing about these truffles: other than what’s already in the chocolate, there’s no added sugar in these. The ingredients are nuts and dark chocolate. That’s it. As noted in a previous post, homemade gianduja is so much more wholesome than Nutella. You could almost consider these truffles… healthy? Don’t want to temper chocolate? Roll them in nuts instead. I decorated the truffles using a piping bag filled with tempered milk chocolate. It’s a really fun technique — I felt like I was in kindergarten art class. But feel free to skip this part. In fact, you can make these truffles without any tempering at all! Dip the truffle centers in untempered chocolate (melted in the microwave as described below) and then roll them in chopped hazelnuts, sugar, crushed corn flakes or whatever else you think of. Nobody will know the chocolate shell is untempered if it’s hidden this way. Shelf life: at least two months at room temperature; up to six months in the refrigerator. You can also can skip the chocolate shells entirely and roll the centers in chopped hazelnuts, cocoa powder, cocoa nibs, crushed corn flakes, sugar, ground coffee beans — be creative! To roast the nuts: On a baking tray on the center rack of your oven, toast the hazelnuts at 350 degrees Fahrenheit for 15-20 minutes, stirring occasionally, until they’re fragrant and brown but not burnt. Wrap them in a clean dish towel to cool on the counter. Use the towel to rub off the skins, and remove any stubborn skins with your fingers. Leaving the skins on won’t ruin the gianduja, but I think they taste a little bitter. To melt the chocolate: Melt 8 oz chopped dark chocolate in the microwave. To do this without burning the chocolate, place it in a plastic container (glass or ceramic will retain too much heat) and microwave for 2 minutes, stirring every 45 to 60 seconds. Stir well.Continue microwaving at 10 second intervals, stirring well after each interval. To avoid burning the chocolate, stop when it’s 80% melted — the residual heat of the chocolate will melt the remaining pieces as you stir. The whole process should take less than 5 minutes. To make the gianduja filling: Reserve 4 oz toasted hazelnuts. In a food processor, blend the remaining 8 oz hazelnuts into a paste. The consistency should be like that of peanut butter. Add the melted chocolate. Blend until creamy. Congratulations — you’ve just made gianduja! You can stop here if you want, storing the gianduja in a tightly sealed container away from sunlight for 1-2 months, or in the refrigerator for 6 months or more. Note that if you store gianduja in the fridge, you’ll need to leave it at room temperature (or microwave it) to bring it back to a soft, spreadable consistency. Or, continue on to the next step to make truffles with it. Note: If the gianduja is too soft immediately after making it, refrigerate for 30-60 minutes before rolling it into balls. Just remember it’s very important to bring the balls to room temperature before enrobing them in tempered chocolate. To enrobe the centers: Melt and temper the remaining 8 oz chocolate. One at a time, drop each truffle into the chocolate and scoop it out with enrobing forks (a kitchen fork will work in a pinch). Place them on parchment paper to set. If you chose to use untempered chocolate for this step, you’ll need to roll the balls in a bowl of chopped hazelnuts (or your coating of choice) before the chocolate has a chance to set. To decorate the enrobed truffles: Melt and temper* the milk chocolate and pour it into a large plastic sandwich bag. Twist the end of the bag to push the chocolate into one of the bottom corners. Using scissors, snip off the tip of the corner (ta-da — you have a piping bag!) and, squeezing from the twisted end of the bag, pipe milk chocolate stripes, swirls or dots onto the truffles. Work on parchment paper for easy cleanup. Fun, right? *Milk chocolate should be tempered at a slightly lower temperature than dark chocolate, so my seeding instructions won’t be that helpful for this. For now I recommend you check out the instructions for tempering milk chocolate on Ecole Chocolat’s website.